Are You Tight With Your Patron Saint? OK, get set for Thursday’s show, when we’ll get your takes on how close you are to your patron saint. Do you even know who the saint is you were named after? Maybe you don’t know if you were named after a saint. If you do have a spiritual relationship with your patron saint, let us know what you do to strengthen that bond. Looking forward to being with you again soon! how are you sure who your patron saint is? and how do you figure it out? If Gina is short for Regina, that means “Queen” in Latin. So it is likely that your patroness is the Queen of Heaven, Mary. 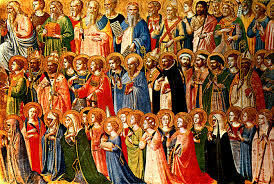 I was listing to the show today on patron saints and just wanted to let you guys know how great it was hearing the callers explaining their relationship with their saints. I started to call but I was too late. My patron saint is St. Jude. I get a laugh sometimes when I tell people St. Jude is my patron saint. This is because St. Jude is the patron of hopeless cases, and I guess I don’t look too hopeless. Well I decided on St. Jude when I was about 10 or11 years old, I am now 60. My mom always had a statue of St. Jude in our house with a lighted candle in front of him and I knew he was for impossible causes. I went with my dad to the court house to get a car title changed to his name, I was 10 or 11 years old. My dad never owned a “new” car until he was in his fifties. The car he was changing the title was given to him from an uncle. My dad had all the paper work in his hands guarding it with his life. When we got to the counter the clerk asked for the title, my dad fumbled through the paper work and could not find the title. He looked at me like had eaten it and asked if he dropped it. I said I don’t know I didn’t see anything fall. Well you can’t change a name on a car title without the title, so we left the court house with my dad looking like he was about die. On the way home I silently prayed to St. Jude to help out in this hopeless case. A week later my dad received the title in the mail. Someone found it and mailed it to my dad. How this person knew our address is beyond me. From that day on I found my patron saint. The miraculous St. Jude.